Wayde van Niekerk of South Africa has won the men’s IAAF World Championship 400m final today in Beijing. 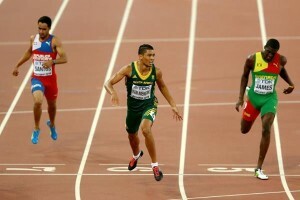 Van Niekerk’s time was 43.48, with defending champion LaShawn Merritt (43.65) and Kirani James (43.78) close behind. This is the first time in history that three men have gone under 44 seconds in one race! Van Niekerk has now earned the title of fourth-fastest man in history. This win also brings South Africa the first global victory at the 400m since the 1920 Olympic games. Read more about this amazing race by clicking here and stay tuned to APT’s news feed and Facebook page for more track news!